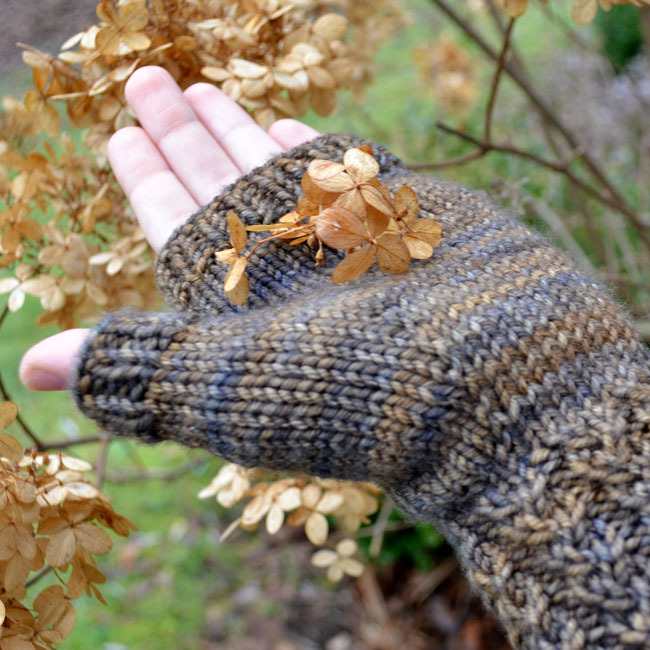 Need a pair of fingerless mitts to go with your Back Roads Hat? At long last, here they are! Back Roads Mitts feature the same, lovely textural pattern as the Back Roads Hat as well as a longer cabled cuff to keep out the drafts. 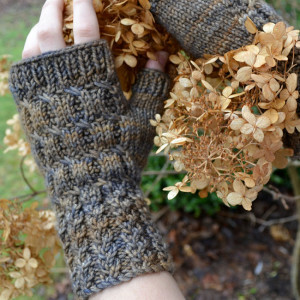 I have worked the pattern for three sizes, so Back Roads Mitts fit hand sizes of approximately 6.5, 7.5, 8.5” (16.5, 19.1, 21.6 cm) palm circumferences. No matter which size mitt you choose to work, the pattern will be neatly centered on the back of each hand. Like my Back Roads Hat, my mitts sample was knit using one 4 oz/110 gr (200 yds/183 m) skein of Madelinetosh Tosh Vintage (100% superwash merino wool) in the Badlands colorway. All of the gravel, dust and grit of a quiet back road in one delightful colorway! The stitch patterns are charted in this pattern, but the pattern also features complete written line by line instructions so the ability to read a chart is not necessary to work this pattern. So, although Robert Frost had to choose between one road or the other, there is no need to choose between hat or mitts – you can have BOTH for your adventuring! Full pattern details for the Back Roads Mitts can be found here.